December provides the perfect opportunity for children to write their own cards whatever their level of skill. They can also make cards to send which adds to the enjoyment of this activity. Writing cards allows them to practise writing their name and also encourages them to independently write the high frequency words ‘to’, ‘love’ and ‘from’. It is important to take children’s concentration skills into account and if necessary only do a few cards at a time. Top tip: If your child does not have a comfortable pencil grip try this magic tissue technique. Ask your child to hold a decorated tissue using the little finger, ring finger and middle finger of their dominant hand. Once this is in place it is very easy for them to achieve a comfortable pencil grip. A cotton wool ball can be used instead of a tissue. 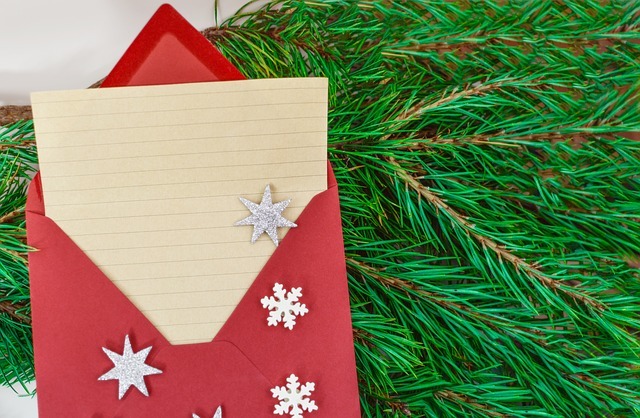 The festive season also provides an opportunity to create lists with your little ones. Shopping lists, present lists, job lists, card lists, the list is endless! By writing lists adults are modelling writing and children learn that writing has a purpose. Children usually don’t need much encouragement to write a Father Christmas wish list and they can even post this to the North Pole. 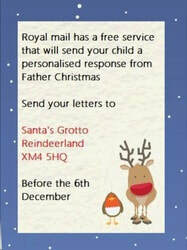 Don’t forget to include your full name and address in the letter to receive a reply back. The list may be pictorial with drawings, cut out pictures from magazines, contain initial letter sounds, or include some whole word attempts. After Christmas children can write thank you cards practising the same skills used to write their cards. This really is writing for a purpose! Little ones love clip boards, they give a sense of importance! White boards and dry wipe pens are popular as the writer can erase and start again. Print off some festive themed paper. In addition to this you could also ask them to write a list of children and teachers they want to write cards to so you know exactly how many you need to sort together. Don’t forget to praise every success however small!